I join Vassily Kulyev on his rusting Soviet-era harvester as it wheezes and groans through a field of barley. Two other men as well worn as the machine itself are perched on top of the grain tank. Vassily tells me each member of the crew will get £3 ($5) for working from dawn till dusk. I ask him where the young men are. "Gone abroad," he says flatly. I grab a bottle of the Mosel white, rub off the dust and hold it to the light wondering if this had been touched by Hitler's henchman. It's murky, bits of cork appear to be floating in the liquid. "Don't remove the dirt, even the dust is valuable," Alexeev admonishes. "How valuable?" I ask. "Well, each bottle is worth £15,000 and there are 129 of them," he says. But it's not Herman Goering's wine that is on Alexeev's mind today, it's the collection belonging to a contemporary figure - a certain Vladimir Putin. Mr Putin has his own cave in the Cricova tunnels. Every statesman who visits the winery is accorded the honour of a personal collection, but Mr Putin's stash is noticeably bigger. "He has been here several times - he likes this place so much he held his 50th birthday party here," Alexeev tells me. Then his face darkens. "Of course things have changed a lot since then." Russia's love affair with Moldovan wine, fostered during the Soviet supremacy, has come to a bitter end. Mr Putin has been infuriated by the Chisinau government's decision to cosy up to the EU. And as Moldovans know from events in neighbouring Ukraine, Moscow is inclined to exact retribution. To punish the Moldovans for shunning his plan for a "Eurasian Union" spanning the former Soviet empire, Mr Putin ordered a ban on the importation of Moldovan wine. "It has been like a cold shower on us - we've lost 30% of our exports but we have to learn from this. We need to find new markets in Europe, in the US and in China. We cannot rely on Russia," says Alexeev. So now Moldova's pro-European government is watching the horrors in Ukraine with a deep sense of foreboding. When Mr Putin talks of restoring Russian greatness, of reasserting Moscow's legitimate interests, he's sending a message to Chishinau as well as Kiev. 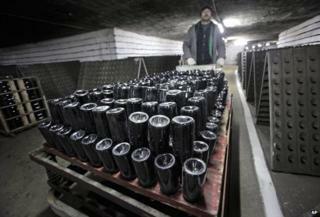 As the winemakers of Cricova know to their cost, Russia still has leverage in the lands it once ruled. The wine embargo was the opening salvo, but it may not be where the hostilities end.